CSIRO expert Dr Klaus Joehnk says that high temperatures and dry conditions associated with heatwaves will continue to create ideal conditions for blue-green algae. Credit: Facebook/Debbie Newitt/ABC. Have you seen the distressing videos and images of mass fish deaths in the news over the new year? 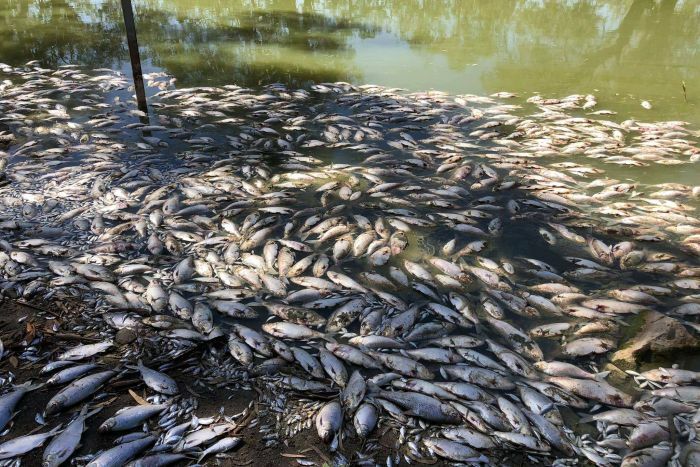 In the past month, it has been estimated up to a million fish have died along a 40-kilometre stretch of the Darling River in far west New South Wales. Blue-green algae has been identified as the primary cause and the dead fish have included native species such as bony bream, Murray cod, and golden and silver perch. In addition to the distressing loss of fish, news articles have advised people not to swim or drink contaminated water in ‘red alert’ algae areas and farmers have been asked to find alternative water sources for livestock. 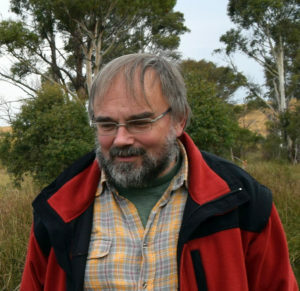 We sat down with our blue-green algae and freshwater ecosystem expert Dr Klaus Joehnk to discuss the science behind the recent toxic algae outbreak and the mass loss of fish. According to Klaus, the severe blue-green algae outbreak resulted from a combination of factors, including drought and heatwave conditions, and no water flow. Why do we get blue-green algae outbreaks? Every year in the summer months Australian waterways regularly experience the occurrence of blue-green algae (cyanobacteria) outbreaks. Warm, slow moving or stagnant water, high solar irradiance (direct sunlight or lack of clouds) plus plenty of nutrients are the perfect conditions for algae to grow. As these algae start dying there is a rapid decline in dissolved oxygen in the water due to decomposition to levels that can lead to fish deaths. Deaths can be extensive when fish cannot move to safe spots or artificially created refuges. Why was the outbreak so severe in the Murray Darling Basin? Development of an extensive and concentrated blue-green algae bloom due to heatwave conditions, no water flow, and nutrient concentrations in the water due to a range of human-derived and natural inputs. The sudden passing of a cold front, leading to water mixing bringing up anoxic (deoxygenated) water. With the water column (from river surface to riverbed) experiencing low oxygen levels, fish had no refuge to swim to, and thus died. Can the Murray Darling Basin expect more blue-green algae as summer continues? Unfortunately yes. High temperatures and dry conditions that come with heatwaves also mean an increase in water temperature and continued ideal conditions for blue-green algae. The decaying dead fish are also contributing to lower water quality and less oxygen in the water. 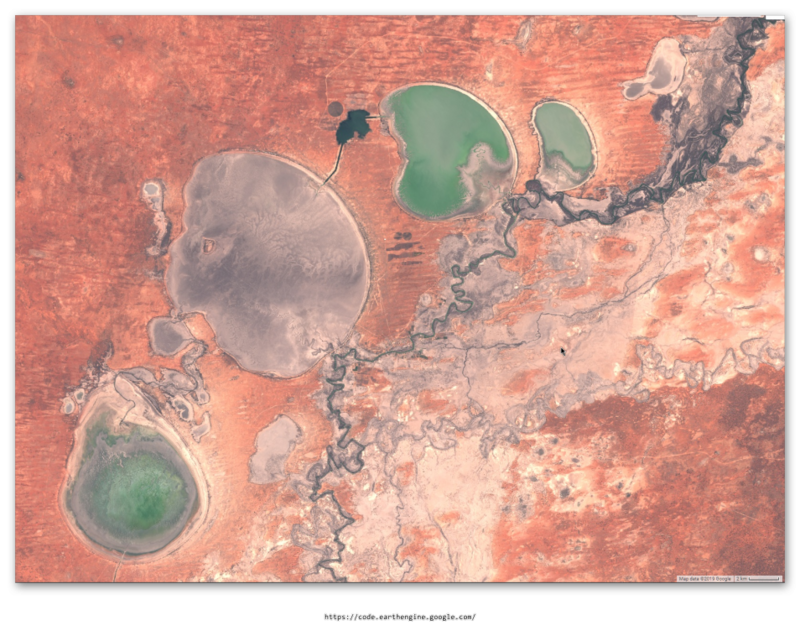 Menindee from above: a satellite image from the day before the disaster, 4th January 2019. Generated with Google Earth Engine using free Sentinel 2 satellite data. What are the options for management and control of blue-green algae? Our water scientists have a long-standing active program building up an understanding of the complex chain of events that leads to an algal bloom, and the aftermath of toxins released into the water. We are developing short-term forecasting capability to predict cyanobacteria bloom development on a short, seven-day term. This is based on remote sensing and models. Fast and cost-effective assessments of water quality, such as on-ground and satellite remote sensing approaches, as well as more continuous monitoring systems can be used to assess the conditions of our inland water. This can identify and predict potential changes in water quality in response to changes due to outside influences, such as land use changes, flooding, fires, and climate. We have already been investing in the development of these monitoring systems in some parts of the basin. We are also working on physical, biological and nutrient controls to manage the algae. We are continuing to work with state and federal agencies, including with the Murray-Darling Basin Authority (MDBA), to support the MDBA’s modelling and forecasting work in relation to water management and planning. Keen to learn more about blue-green algae? The ‘normal’ conditions assumed in the Basin Plan and other management response designs is the large weakness. As climate variability increases and water extractions become more intense – through farm water storages and improved on-farm water efficiencies – less will flow into the waterways during dry years, which comes more regularly. Unless we change our management philosophies sadly these events relating to environmental dysfunction will likely to come more often. Of course as fish stocks deplete and the predator-prey relationships alter to the detriment of biodiversity, the magnitude of fish kills could decline. Nice work on satellite mapping! There really is no solution to this problem with the way we currently use these waterways. Current, farming, ongoing land mismanagement, pesticides, erosion, mismanaged catchments, etc etc. In regards to oxygenation I suspect the de-snagging of rivers in the past has also contributed to the poorly oxygenated water as the water movement over and through these once snag ridden waterways would have helped mix the water, looking at these systems now huge stretches of water are devoid of natural structure. It is also important to note that waterways would occasionally dry up prior to European settlement however the rivers were much deeper and often not as wide leaving deep billabong styled systems that would house the fish until the next water made its way down the system, again due to a complete mismanagement of the land we now have very wide shallow waterways due to land clearing which in turn creates erosion filling waterways with once rich soils, again prior to European settlement the annual flooding event would lift the sand up in the flood plains digging the channels deeper often creating a system that was once shallow one side and running into a deep gutters on the other depending on natural flows. We must remember all earth based systems are symbiotic and each action has a reaction, with so many years of abuse we are now able to watch major river systems collapsing. Similar with the “Black water” events we are witnessing in Victoria, a completely natural event for the river to flood which is now causing major fish kills. Only an uninformed idiot would deny that our use of these nature systems is a complete failure. Do we have any idea how much damage has been done to river systems that have been hit by these episodes? The fish are surely only the obvious casualty. Is there any way back form this if we maintain our current ag practices and how feasible are the needed changes, particularly if that involves the use of fertilisers and water. No comment about the ‘elephant in the room’ – climate change. Why? In large bodies of water, such as Menindee could we install oxygenators- solar powered? These are just pumps- they pump air into the water. Oxygen should freely move to low areas of oxygen and give fish an area of refuge. Pumps should be relatively inexpensive and could be programmed to operate when oxygen levels are poor.